While "Lana" is way out there moving away from Mexico there are 2 areas of disturbed weather that have the potential for tropical development. 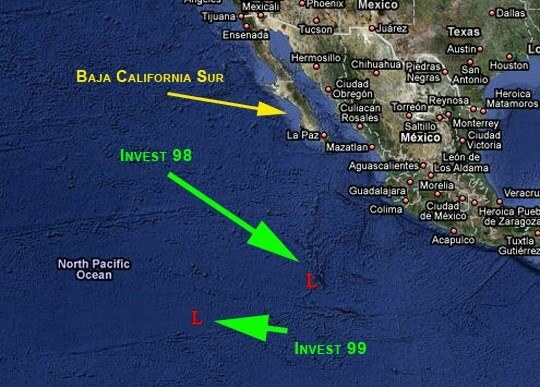 Invest 98 and Invest 99. Both are calculated to go the same direction as "Lana" - so away from Mexico and the Baja. Lana remains in deep easterly flow south of the subtropical ridge. Global models continue to build this ridge as Lana moves westward keeping Lana well within the broad easterly trade wind belt. The official track remains the same as the previous package lying just south of the majority of closely grouped model consensus. System motion remains in good agreement with most of the objective aides.